It is specially designed for professional astrologers and persons who want to start a business in the field of astrology. LeoTouch printing features will be added shortly in the software but the charges for the same will have to be paid by the user. It is available in languages like Hindi, English. The best astrological software LeoTouch Varshphal has brought revolution in the field of astrology by making it reach to common man. Its market value lies in its credibility. The reason behind its popularity is its accuracy. It really helps astrologers to get most accurate calculation by just a click and saves their time. This astrological software contains complete Astrological Calculation with Remedies, Predictions, Various Charts, Dashas etc. Available in Hindi and English with modules Astrology, Varshphal, Tables, Books, Calendar, Transit, Mantras and lots of other useful informations. This is perfect business tool for professional astrologers. 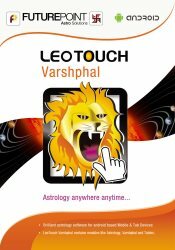 LeoTouch Varshphal astrological software is based on accurate astrological calculations. This astrological software is the result of years of extensive research work. You can use it easily with the little help of somebody as it is simple and user friendly. According to astrologers it is the easiest astrological software in the world. One can get most accurate, excellent and comprehensive results from this software. This is a unique software containing great features in it. It contains Astrology, Varshphal, Gochar(Transit), and Mundane in more than one language. It also incorporates Sagar Chakra, Mantra, Tarot and Ramal. Astrologers can use these systems too. You can also get a print out of it. Astrologers can easily customize it according to their needs. Kundli, Dasha and Lagna chart can be used as per required convenience. LeoTouch is best answer to get accurate horoscopes instantly. There doesn’t remain any possibility of any illusion regarding the degrees and placement of planets. Contains a data of longitude and latitude of 1Crore cities.